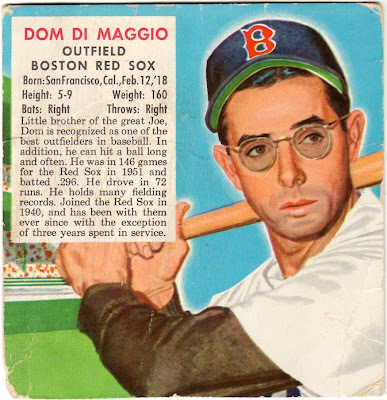 "The Little Professor," youngest of three major league DiMaggios, spent all of his 11 years patrolling centerfield for Boston, a counterpoint for brother Joe's HOF career in New York. It's debatable who played better defense, given Yankee Stadium's cavernous dimensions and Fenway Park's crazy angles, but they were both great with the glove. 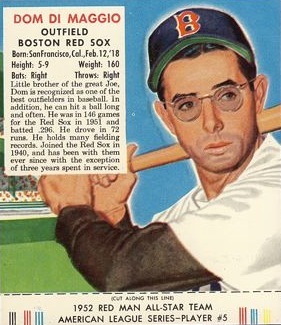 Joe joins this list if you lower the bar to 90%, still an impressive level that includes just 29 players. Center field isn't an easy position to hang on to! 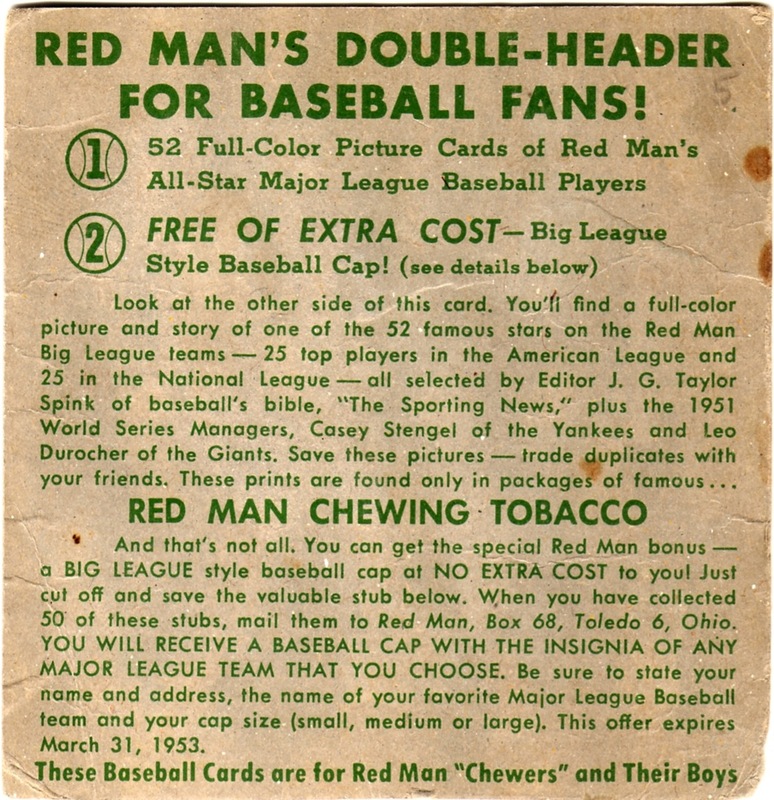 RedManCards.com features checklists for all 4 years of Red Man cards (1952-55). 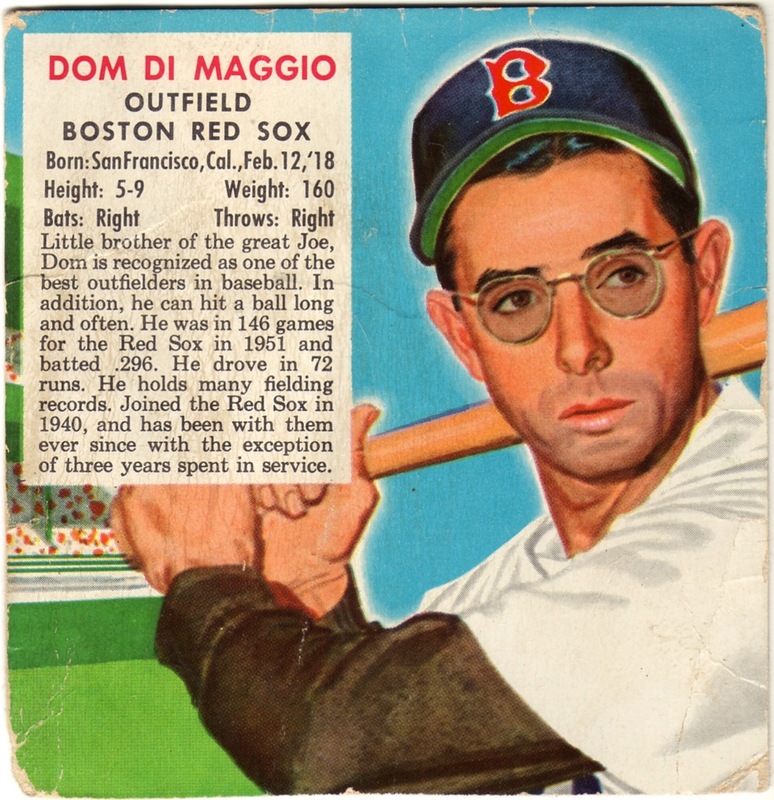 My DiMaggio's missing the bottom tab, which included the #5 card number. Here's a complete version, which commands somewhat more money. Value: Low-grade #5s cost about $10 and creep up as condition improves. I recommend checking eBay values only by completed auctions, since some sellers set unreachably high asking prices. 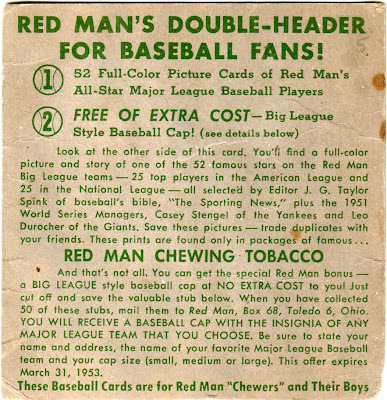 Fakes / reprints: Red Man set reprints use white card stock, black borders around the front image, and say REPRINT on the back. I have been missing most of the blogs I follow of late and have only managed 1 post per month in my own, when I did write something. I just made one last night for the first time in quite a while. I guess I am really not much of a writer and burned myself out with this new concept (for me). I went back through your posts and saw some really sweet #5s. I am even jealous of some!! Always fun to see what pops up next in a very interesting theme of collecting.